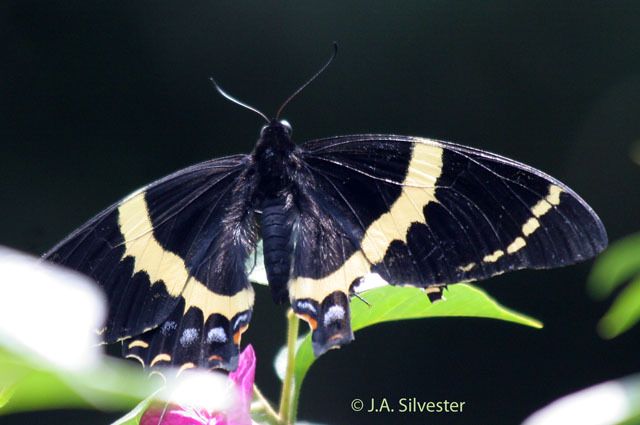 Identification: Large black swallowtail with spatulate tails and a distinct central yellow band on each wing. Wing Span: 5-7 inches (12-15 cm). Caterpillar Hosts: Avocado and magnolia. Adult Food: Wild fuchsia in Costa Rica. Habitat: City gardens, cloud forests. Range: Central Mexico south to Costa Rica. Rare stray to Texas. Management Needs: Not needed for rare stray.